I'm a little shocked at how quickly this year is flying by. I can't believe that Thanksgiving is right around the corner! I am not sure if I am hosting any dinners this year, but I do know that we will be visiting with family on Thanksgiving day, and that means I still have to bring a dish that the whole family will enjoy. 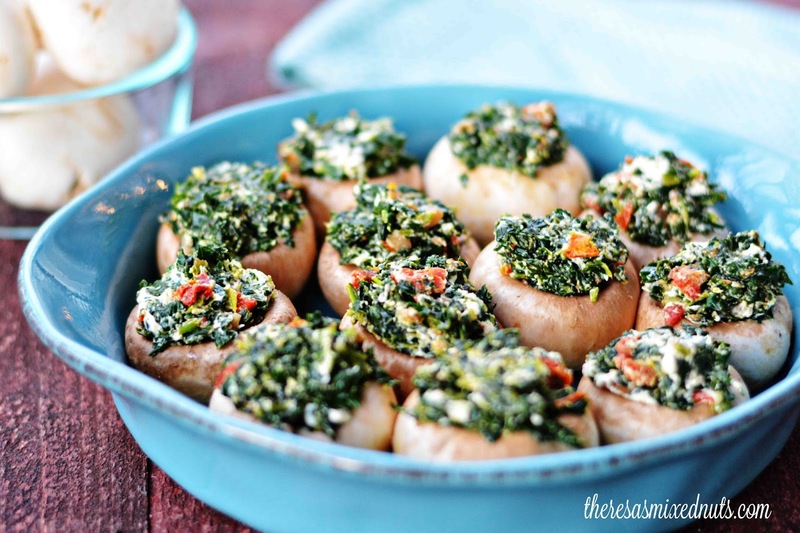 Stuffed mushrooms have been a favorite of ours for many holiday meals, and I usually make spinach dip stuffed mushrooms for our party. But, I did come across these Sundried Tomato-Stuffed Mushrooms last week on Golden Blossom Honey and thought I'd shake up our mushroom dish this year. I have never used goat cheese in my cooking before, but I found that the flavor of the cheese meshed really well with the tomatoes and mushrooms. These are a rich and creamy appetizer that are a perfect fit on any dinner buffet table! What side dishes are going on your Thanksgiving menu this year? They do look nom nom... you will have to prepare hundreds of them to feed the clan! I've just read a simple recipe from an Italian cook I follow at Facebook (I follow him because he's a hunk) he just slices the shrooms, spreads them on the baking sheet with some salt, pepper and oil and bakes them for 15 mins. Never tried to bake them sliced and spread like that. You are such a hoot, Dezzy! At least you are getting some cooking tips while oogling the eye candy ;) I have never baked them either. Normally, I just slice them, toss them in a pan with a little olive oil and fry for a few minutes. Then, add a little salt, pepper and thyme and call it done. the same as I do, except that I put celery leaves and vegeta over them, but they could be more crispy if baked... we shall try it :) I sometimes hate it when I filled them and bake them in the oven they let out water and end up all with soggy bottoms :) This could be a solution for it. Yes, I was thinking that baking would cause them to go soggy, but making the salt and pepper soak up some of that moisture, leaving firm mushrooms? I'm definitely trying this on my next batch to see how it goes. Seriously, I don't know why you don't have a cookbook started yet. I really think that's something you need to consider! Oh my friend, you are a genius. These are so easy to whip up and they sound SO AWESOME!!! These sound absolutely delicious. I love stuffed mushrooms so much. These look so good. They actually sound really healthy and they'd be really cute sides for a get-together. I love sundried tomatoes and mushrooms. I know this would be so tasty! I love tomatoes, this recipe looks great! I so need to make this for my family! That looks so yummy! This will be a hit at any party. give me someee...I love sun dried tomatoes and mushroom..perfect combination, Theresa..
Oh my heck, these are going to need to get made at my house pronto! My husband would LOVE these! My granddaughter loves goat cheese. My son won't eat it because it's called 'goat' cheese. I told him the cheese he likes is 'cow' cheese but he said it's not the same, lol. Your recipe looks great as always! 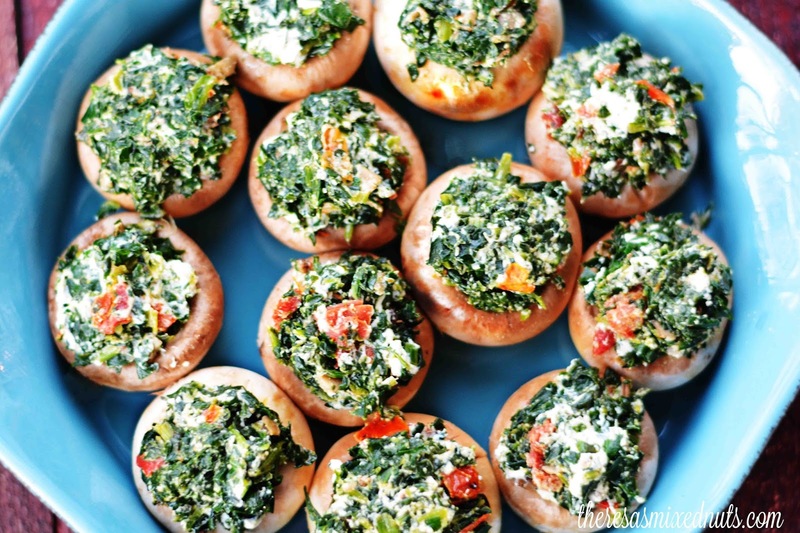 These stuffed mushrooms look so good. I've never been a fan of mushrooms but I would definitely try them this way. I miss having Thanksgiving dinner with my family in Florida! I guess this side dish would also go well for our Christmas family dinner. Thanks for sharing the recipe. It does look so yummy. We love cheese in this family. Any kind! This recipe has everything we love - mushrooms, shallots, cheese and tomatoes! That looks so good. I'd love to try this for our upcoming Thanksgiving gathering. I love stuffed mushrooms. I usually have them with cream cheese and sausage. This variation sounds super delicious. I'll have to try it sometime.